The majority of microfluidic systems are dependent on external equipment like syringe pumps to enact and control flow within a device. Capillaric circuits are unique in that they rely only on surface tension effects to regulate flow. 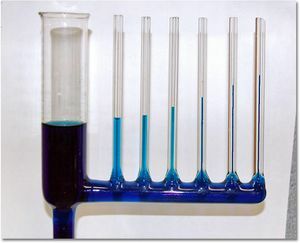 Capillary action, sometimes known as capillarity, is known as the ability for small amounts of liquid to travel in narrow (capillary-sized) spaces without an applied external force. Capillaric circuits, named after capillary action, strategically uses the forces that contribute to capillary action-- surface chemistry and material geometry-- to automate flow. Surface Wetting and contact angles are extremely important considerations in capillaric circuits. Wettability refers to tension between adhesive and cohesive forces between a liquid and a solid that will determine if the liquid spreads across the surface (adhesive forces dominant) or balls up to minimize contact with the surface (cohesive forces dominant) 5. A contact angle less than 90° is considered to be favorably "wettable" meaning the fluid will spread across the surface. If a contact angle is greater than 90° it is more likely the fluid with ball up into a bead on the surface. The wettability of the surface used in microchannels is important because it dictates the direction of the liquid in the channel. For example, a wettable (<90° contact angle) surface will produce a negative capillary pressure wicking liquid into a channel, whereas a surface with a contact angle greater than 90° will show a positive pressure and push liquid out of the tube. Varying the wettability of surfaces in a device is one way to exploit capillary effects to automate fluid flow control. The contact angle of the liquid to the surface in a conduit results in a curvature of the liquid, commonly observed as a meniscus. 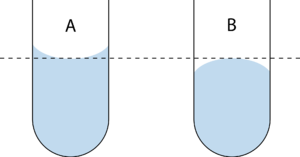 A wettable surface will produce a concave liquid-air interface (as seen in Figure 3.A) and will result in a negative capillary pressure. A surface with a contact angle greater than 90° will show a convex interface (Figure 3.B), and a positive pressure. Equation 1 and Figure 1 both show that as the dimensions of the channel decrease, the capillary pressure increases. 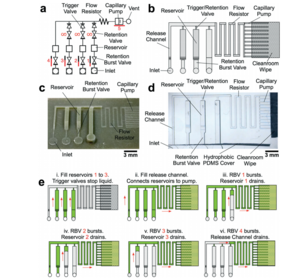 Passive microfluidic systems do not require external equipment and are characterized by minimal user intervention. Fibrous or Paper Microfluidics use porous fiber substrates to control flow in these devices. Fibrous microfluidics have been studied since the 1930s and can be found commonly in pregnancy tests 7. Flow rates in these devices can be controlled with valves made of soluble waxes and sugar barriers 6, and 3-dimensional paper folding 7. The wicking of wetted fibers is a well-known and easily observable phenomenon, and threads and yarns have been shown to be an unexpected but interesting material for building fluidic circuits 7. The most common production method of capillaric circuits is Photolithography, the direct patterning of silicon substrates, which is an expensive and slow process because it requires access to cleanroom infrastructure 8. Simpler, more cost-effective fabrication methods include soft lithography which takes a negative of the capillaric circuit design etched into silicon wafer with photoresists which is then used to produce many replicates. This is also known as Replica molding (REM) Typically these replicates are made with PDMS. However it should be noted that PDMS has a contact angle of 107°, meaning a surface treatment is required to produce a wettable surface. PDMS replication is excellent and efficient for laboratory use but too slow for industrial mass production-- where it is more economic to produce a PDMS mold to replicate UV-curable polymers for injection molding 5. Microchannels in a capillaric circuit are analogous to lines of electrical current in an electrical circuit. A resistor in an electrical circuit is something that restricts the flow of electricity, similarly fluidic resistors restrict flow of liquid by constricting the radius of the channel. Due to the small dimensions of the microfluidic systems, small changes in radius with have significant effects on the flow resistance of the circuit. To construct more complex circuits with a wider variety of functionality, there also exist many types of pumps and valves to control flow pressure in the channels. Capillary pumps are analogous to a voltage source in an electrical circuit and serves to produce a constant capillary pressure. These pumps work by filling reservoirs in the circuit with posts and the gaps between the posts controlling the pressure drop and strength of pump 1. Capillary valves stop the flow of a liquid through a channel until some condition is satisfied and the flow continues through the conduit. Hydrophobic valves consist of a region of the channel with hydrophobic surfaces causing the liquid flow to stop within the hydrophobic interface, and continuing only when the pressure is great enough to pull the fluid through the interface. This page was last edited on 14 April 2019, at 20:29.